Marine Head and Lateral Line Erosion, also known by the acronym MHLLE, is truly an anomaly among ornamental marine fish diseases. While most other ailments have been studied enough to have reached a consensus on their exact causes and proven cures, the hobby has reached no such consensus about MHLLE. Unfortunately, MLLE is not a problem in aquacultured fish, and as a result, little research money has been allocated to discovering its definitive cause(s). This leaves us with primarily the speculation in the hobby and limited (and often conflicting) scientific studies as to its cause. Consequently, there are a number of theories regarding MHLLE's cause making some sense and showing some promise, but no one cause has been proven conclusively to be the cause of MHLLE; therefore, there is no consistent treatment to correct the problem. In this article, I will discuss and evaluate some of the speculated causes of MHLLE. Note that I am using the phrase "Marine Head and Lateral Line Erosion" instead of simply "Head and Lateral Line Erosion." This is because a similar freshwater ailment exists, which I want to differentiate from the marine version during later discussions. Although most authors refer to the freshwater affliction as "Hole in the Head disease," some confusion remains because other authors use the two phrases interchangeably. I have even heard the term "face rot" used to describe either ailment. In this article, I will draw a clear distinction and use either "Marine Head and Lateral Line Erosion" or its acronym "MHLLE" for this particular disorder throughout this article. This ailment's initial manifestation is usually the development of small pits around the eye and on the head and adjacent area. As it progresses, the holes grow larger, eventually connecting to become larger lesions, additionally extending back along the fish's lateral line. In advanced cases, the fins and gill covering begin to erode. While this condition is seldom fatal, it can horribly disfigure a once beautiful fish. In my experience, minor cases that are stopped can allow a reversion to a normally appearing specimen, but once it has progressed too far, the fish may be permanently scarred. One species is a common exception to this syndrome's usual manifestation. 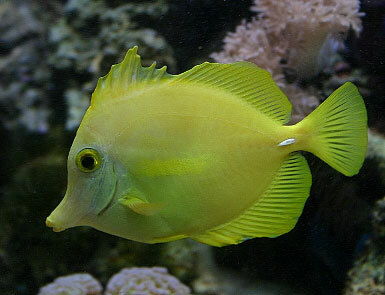 Yellow tangs (Zebrasoma flavescens) do not appear to be afflicted in the same manner as other fish (Hemdal, 2003). They first tend to lose their vibrancy and lighten in overall color. Then their fins erode, usually beginning with the soft tissue between the dorsal fin's rays. If there is any erosion around the head or down the lateral line, it is usually only minor. This is not, however, the case for all species of the genus Zebrasoma. I have witnessed purple (Z. xanthurus), sailfin (Z. veliferum) and brown (Z. scopas) tangs all exhibiting the classic signs of this condition, while every Yellow tang I have seen with MHLLE has always exhibited this atypical symptomology. A Yellow tang (Zebrasoma flavescens) with a typical manifestation of MHLLE. Notice the relatively minor pitting around the eye and down the lateral line while the dorsal fin is showing significant erosion. There is some question as to whether or not these atypical instances in yellow tangs can rightly be called MHLLE. And, I will freely admit that since we don't know for sure what causes MHLLE, we also cannot say for sure that these disfigured yellow tangs are suffering from the same thing. But, in my opinion and that of others (Hemdal, 2003), it would be awfully strange if they were not related. The common factor being that fish held in captivity, in many instances in sub-optimal environments, develop tissue erosion of one type or another. Surgeonfishes and angelfishes are the two fish groups most commonly afflicted with MHLLE (Blasiola, 1990 & Hemdal, 2003), although other fish also are susceptible to this ailment. Groupers and damsels are known to have problems with MHLLE, even if it is not as commonly encountered. Of all the fish I have ever seen with this condition, blue regal tangs (Paracanthurus hepatus) are by far the most frequently observed to have MHLLE. After them, various species of Zebrasoma seem to be the next most common, followed by Acanthurus, Centropyge and Pomacanthus species. On the other hand, some families of fish, such as wrasses, appear to be immune although they sometimes do suffer from other mysterious ailments that may be related to MHLLE, as I will mention later. showing a severe case of MHLLE. Dietary deficiencies are one of the most commonly cited factors in outbreaks of MHLLE. When a discussion comes up on a message board regarding a fish afflicted with MHLLE, one of the first questions typically asked is what food is being offered to the affected fish. That is usually shortly followed by recommendations of various vitamins and other additives, as well as changes to its nutritional regime. This theory, besides being popular also has some evidence to back it up. 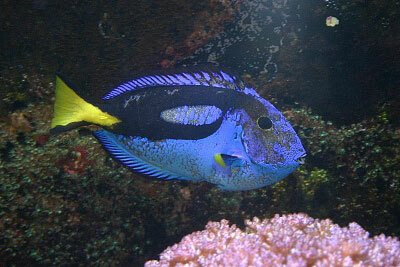 Blasiola (1990) conducted a small study in which he compared two groups of blue regal tangs, Paracanthurus hepatus. One group was fed a flake food diet low in vitamin C while a second group was fed a flake food diet supplemented with live algae. After only three weeks, the fish in the first group began to exhibit small areas of discoloration around their eyes. The condition continued and progressively worsened throughout the testing phase. After 95 days the testing was stopped because of the severity of the disease's advancement. At that time the afflicted fish were switched to a diet that included algae and supplemental vitamin C. In just ten short days, the fish began to demonstrate improved color. This would seem to suggest a link between vitamin C deficiency and MHLLE. Unfortunately, not all cases can be traced to a mere vitamin C shortage in the diet. 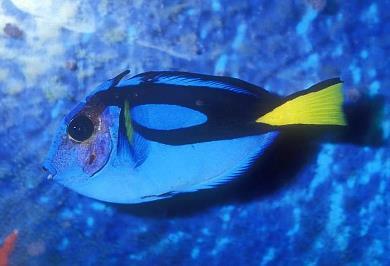 For example, Collins (1995) reported experiencing an outbreak of MHLLE in Atlantic blue tangs (Acanthurus coeruleus) in a display at the Indianapolis Zoo. These fish were fed a diet rich in vitamin C, but suffered from MHLLE nonetheless. After some adjustment to their diet, which revolved around ensuring they received a sufficient amount of vitamin A, they recovered so much that only those that initially had been most severely affected retained some scarring; no further MHLLE events were experienced. One more note about these two reports: in the subsequent Q&A session after Blasiola reported his study at a conference, there was some discussion about whether or not activated carbon could have played a role in the outbreak that his test subjects experienced. On the other hand, the display at the Indianapolis Zoo, where Steve Collins was curator, had experienced MHLLE problems that he believed were tied to vitamin A deficiencies, yet the system did not use any activated carbon (Collins, 1995). Please keep these comments in mind when I revisit activated carbon in subsequent sections of this article. I have read some discussions on various message boards that implicated a lack of iodine as a possible cause of MHLLE. Usually, the iodine deficiency theory was offered as an explanation with some other related factors; namely, that iodine and/or other beneficial elements were removed by protein skimming or activated carbon. Alternatively, some argued that the iodine was not available because it simply had been all used up, and that more was needed and should be supplied via direct dosing or increasing the frequency and/or amounts of water changes. Lastly, a lack of iodine in the diet is known to cause goiters in some fish and at least one authority (Michael, 2003) believes that such a lack may somehow be related to cases of MHLLE. In my opinion, the entire iodine argument is moot. I perform and recommend to others that they do regular water changes, not as a method of maintaining iodine concentrations, but in an effort to dilute the myriad noxious compounds produced in reef aquariums that are not easily tracked by standard test kits (Borneman, 2003). As there are no accurate means of measuring all the forms iodine may take in aquaria (Holmes-Farley, 2003), and I am adamantly against adding anything to my display that cannot be measured accurately and consistently, I don't use iodine and don't encourage its use by most hobbyists. Poor water quality is the other culprit for MHLLE cases most frequently discussed on the internet and in print (Blasiola, 1990; Frakes, 1988; Fry, 2003; Hemdal, 2003 and Michael, 2003). Factors such as high nitrate levels or perhaps dissolved organics in the water have all been implicated at one time or another as potential contributing factors causing MHLLE. Let's examine each of these in more detail. "High" (whatever that is) nitrate levels have long been thought to be problematic. There are as many recommendations of maximum healthy nitrate levels as there are books on the subject of marine aquarium keeping. Everyone has an opinion and the major point I want to make is that these recommendations are simply opinions. While it may be beneficial to target a low nitrate level, a definitive answer as to what is acceptable and what is harmful will require additional study, although a few studies have been done on nitrate toxicity. Juvenile common clownfish (Amphiprion ocellaris) were shown to have slower growth rates when housed in 100 mg/l of NO3-N than those kept in 15 mg/l (Frakes, 1993). Also in that same article, Frakes cited information from a study showing that a concentration of 500 mg/l NO3-N caused a 50% mortality rate in planehead filefish (Monacanthus hispidus) and a level of 2,400 mg/l had the same effect on Beau Gregory damsels (Stegastes leucostictus). So clearly, nitrate can cause problems, but those all are rather high values, in some cases astronomically high, and unlikely to occur in typical aquaria. As none of these tests showed any connection to MHLLE, whether or not nitrate levels can cause MHLLE, remains unknown. An Atlantic blue tang (Acanthurus coeruleus) showing the typical signs of MHLLE. So what if the measured nitrate level is consistently low or nonexistent? What does that mean? Well, it means just simply what the test says, and that by itself implies nothing else about the tank's water conditions. Countless compounds that we cannot measure are constantly being produced in our aquariums (Borneman, 2003.) Just because the water quality appears to be in the proper ranges on standard aquarium test kits does not necessarily mean that the water is in perfect condition or that there are no foreign or deleterious dissolved compounds in the water. To illustrate this point, consider a theoretical tank that utilizes a deep sand bed (DSB), or other similar means of denitrification, along with kalkwasser or another balanced means of maintaining calcium, alkalinity and pH. Is it not possible to maintain this theoretical tank indefinitely without water changes, while also keeping all of the typically measured parameters in their appropriate ranges? Does that mean the water is perfect for marine aquarium keeping, or that every organism added to this aquarium would live and prosper? Of course not! I don't mean to give the impression that aquarists should not use standard test kits to monitor and track an aquarium's water quality; it should be done, but the hobbyist needs to be aware of the limitations of this methodology. Simply put, one cannot measure all possible parameters. Monitoring nitrate levels as well as pH, alkalinity, calcium and phosphate can explain some of the things that are going on in a system; it just doesn't reveal the entire picture. As an aside, please don't use acceptable readings as an excuse to become lazy with husbandry practices. Remember also that saltwater fish drink nearly constantly as a means of adaptation to a seawater environment. It is entirely possible that the saying "You are what you eat," should be, "You are what you drink," when referring to marine fish. Think of it this way: fish must eat in, drink, breath through and simply be surrounded by and immersed in whatever nasty compounds are in their ambient water. Hopefully, we can see that proper water quality is particularly important, regardless of whether or not it has a direct link to MHLLE. It has been suggested that activated carbon might play a role in MHLLE (Frakes, 1988; Hemdal, 2003; Hemdal, pers. comm. and Michael, 2003), although the exact mechanism that these various authors suggest differs. Some have theorized that the activated carbon in the aquarium's filtration system could remove necessary trace elements that the fish require. Others hypothesize that activated carbon could leach something into the water that negatively affects the fish. And still others speculate that carbon dust may act as an irritant to the fish. As additional "anecdotal support" for this theory, Scott Michael noted that a local fish store he visited that used activated carbon was experiencing MHLLE in almost every fish under its care. And I must say, I too have witnessed similar experiences at retail locations that use a lot of activated carbon and then coincidentally experience massive outbreaks of MHLLE. But this is anecdote, not proof. In these situations there was simply no evidence of what might have happed in the absence of activated carbon, all other things remaining equal. It could just as easily be a dietary concern. Or, perhaps the store was using activated carbon to make up for a lack of water changes or other poor husbandry issues. There are simply too many factors involved to point to a definitive cause. Additionally, activated carbon is used so frequently in the ornamental fish industry and hobby that it is no surprise some fish exposed to activated carbon develop MHLLE. Also, since large numbers of fish routinely housed in systems utilizing activated carbon don't develop MHLLE, and consequently some fish develop MHLLE while not exposed to activated carbon, additional factors must be playing a role in those cases in which fish do exhibit symptoms of MHLLE. Exposure to copper is another often-mentioned theory (Blasiola, 1990; Frakes, 1988; Fry, 2003 and Hemdal, 2003). The beauty of this theory is that because so many fish are treated with copper at various stages of the distributional chain from the reef to retail markets, it is easy to show that exposure to copper has some effect on the onset of MHLLE. But again, the opposite argument must be examined: why don't all fish exposed to copper develop MHLLE? There is no easy answer to that one, but first let's look at how copper might be involved. Copper is a known immunosuppressant (Noga, 2000). Theoretically, copper treatment could simply help allow an infectious agent which causes MHLLE to gain a foothold on a fish. Additionally, copper is thought by some hobbyists to harm beneficial intestinal infauna that fish need to properly digest their food and thereby absorb the necessary vitamins from it (Fenner, 2001). It may be possible that copper may play an indirect role in the dietary deficiency theory. And lastly, all heavy metals, including copper, are poisons that can build up in the tissues (Shimek, pers. comm.). This could help to explain why some fish develop MHLLE while others do not; the number of exposures of varying concentrations resulting in vastly different "body burdens" of specific heavy metals could be playing a role. Of all the theories regarding MHLLE, this is the one that I have the most trouble believing, and, after subsequent readings by David Kessner, it would appear my gut impression turns out to be correct. The phenomenon that we aquarists refer to as stray voltage is actually capacitive coupling; the so-called cure of using a grounding probe actually causes the effect to occur. The abbreviated description of this occurrence is that any electrical device in an aquarium, be that of a heater, pump, etc., acts as a resistor. These are sealed in plastic, glass, or some other nonconductive material, in electrical terms - an insulator. Once the aquarist places a ground probe in the water, another resistor is created by completing the circuit and turning the water into a second resistor. Two resistors separated by an insulator is capacitive coupling and this allows electrons to flow out of the tank through the ground probe. The point being, without the ground probe, the circuit is not completed and no charges flow. Hence, the "cure" for stray voltage and its impact on MHLLE by the use of a ground probe is what causes the stray voltage in the first place. Without the ground probe, there is no stray voltage. Now, I am neither an electrical engineer nor some Radio Shack technology buff. I am a fish geek. I apologize if my laymen's explanation bothers some. If you are interested in reading more, please make use of my listed references and delve into the discussion on capacitive coupling, resistors, insulators, induction and other things that aren't particularly interesting to me. Otherwise, if you are like me, feel free to skip to the next topic with the knowledge that stray voltage is nothing to worry about with regard to your fishes' well-being. While I may be making light of stray voltage and grounding probes, I do not mean to discourage their use in general. I am specifically referring to them only in the confines of a discussion on MHLLE. Ground probes and GFI outlets should be used in all aquariums, but not for the health of the fish. They are for the fishkeeper's protection. Electrocution is a distinct possibility, and a ground probe along with a GFI outlet could save your life one day, so use them. Some hobbyists and scientists hypothesize that exposure to sunlight can help reverse MHLLE. Tom Frakes cited information in his 1993 article that tangs affected with MHLLE at Disney's EPCOT facility were simply transferred from indoor displays to outside holding tanks on the same central system with the same water, and later were noted to have recovered. Hence, the conclusion that sunlight can cure or prevent MHLLE. This makes sense coupled with the complete absence of MHLLE in all wild reef fishes (Blasiola, 1990), which are constantly exposed to sunlight. But it is possible that sunlight could have had only an indirect effect. Perhaps in the outdoor tanks the sunlight encouraged a different, more nutritious growth of algae that was not able to grow under the light of the indoor displays; maybe consuming this improved diet is what actually reversed the MHLLE. Another possible explanation is that this alga (if it existed) removed excess nutrients and dissolved organics from the water. Depending on the flow into and out of these outdoor tanks, it is conceivable that their overall water quality could have been better than in the main indoor tanks, because of the extra algae and the sunlight. Plus, this was not a controlled study. It is possible that the staff and methodologies of caring for the indoor tanks was different than the people/methodologies involved in caring for the outdoor display. Unless great pains were undertaken to eliminate other variables, there is no telling what other changes could have occurred and affected the outcome. Overall, not enough information is given in this brief account to fairly evaluate whether or not sunlight played any direct role in the fishes' recovery. There is a passing mention of a type of tumor that can cause lesions similar to those seen in Blasiola's 1990 article. He states that some species of damselfish have exhibited raised or eroded areas that resemble MHLLE on their head, and that this was caused by a type of tumor that spread from nerve fibers. Unfortunately, that is the extent of this passage and no reference for further investigation is provided. Along these same lines, I will add that I have seen some wrasses, most notably the green bird wrasse (Gomphosus varius) and lunar wrasse (Thalassoma lunare), develop tumor-like lumps around their face after being in captivity for extended periods of time. While wrasses are generally thought to be resistant to MHLLE (Hemdal, 2003), I believe it is possible that this is a different manifestation of MHLLE. However, I will freely admit that this could be something else entirely. At the very least, it is another abnormal, mysterious aliment that seems to only afflict fish held in captivity. As such, in my opinion, it warrants further investigation. This is yet another instance of a potential cause being mentioned briefly but not thoroughly discussed. Fungal infections are mentioned in a list of factors implicated in MHLLE in both Blasiola's 1990 and Frakes' 1988 articles, but without discussion as to why it was thought that fungi may be the cause and without reference to this possibility to follow-up on. Blasiola does state later in the same article that he was unable to find "any evidence of a fungal infection" in the fishes he had examined that had the typical lesions associated with MHLLE, suggesting that fungi do not likely cause MHLLE. The Varner and Lewis paper (1991) centered upon a viral infection as the possible cause of MHLLE. They were able to isolate a reovirus-like agent from what they describe as a moribund Koran angelfish (Pomacanthus semicirculatus). For those readers who don't know what moribund means (I had to look it up), it means dying, declining in health or on its way out. To confirm their suspicions, they exposed an otherwise healthy angelfish to this virus-like agent and were able to elicit lesions similar to MHLLE. There are two problems with this study. First, MHLLE is generally not lethal (Michael, 2003), yet the fish from which they obtained this virus was dying. Second, the study merely exposed healthy fish to this virus, then later noted MHLLE, but did so without a control group. Therefore, their conclusions are more than a little suspect. They didn't, for example, keep a separate but similar group of fish under the same conditions as those in the test group, but without exposure to the virus, to ensure that some other condition(s) that the fish were exposed to, instead of the virus, didn't actually cause the MHLLE outbreak. A control group is an extremely important part of the scientific process, which they chose to omit for some reason that is not clear to me. Because of this, it could be that the virus is what killed the angelfish, but is not what initiated the MHLLE. There are some who believe a parasite in the genus Spironucleus causes this condition (Bassleer, 1996). Spironucleus is the correct name of this protozoan, although many still use the name Hexamita when referring to this condition in freshwater fish. So, it seems reasonable that a similarly appearing condition could have a similar causative agent. Additionally, Spironucleus has been found in some marine fish (Blasiola, 1990), although no indication is given that these same infected fish suffered from MHLLE. According to this theory, the parasite infects the intestine and interferes with its uptake of nutrients. This then is alleged to cause stress and the resulting tissue loss characteristic of MHLLE. Also, in at least one other instance a marine tropical fish was confirmed to be infected with another parasite that causes digestive problems (Hoover et al, 1981). In this paper, a Naso tang (Naso lituratus) was found to be infested with Cryptosporidian parasites which caused the fish to be emaciated from regurgitating its food and passing food with its feces, which appeared to be completely undigested. This fish did not exhibit the characteristic lesions associated with MHLLE, although it did lose muscle tissue. The other thing to note is that Naso tangs are generally thought to not be susceptible to MHLLE (Hemdal, 2003). So it is difficult to say whether or not this fish would have been able to develop MHLLE lesions or if this emaciated appearance is simply another form of this ailment similar to the atypical appearance of Yellow tangs discussed previously. I found one reference suggesting that a dinoflagellate in the genus Amyloodinium could be responsible for an outbreak of MHLLE that occurred at the Newport Aquarium in Kentucky (Fry, 2003). The basic premise is that fishes in a large display at that aquarium were developing MHLLE. In this same display, a sponge was found to harbor a dinoflagellate tentatively identified as belonging to the genus Amyloodinium. One of the aquarium's interns began an experiment to establish whether this dinoflagellate caused the MHLLE. Unfortunately, this experiment suffered a series of setbacks, which brings into question whether any results can be drawn from it. For one, most of the fish in the experiment were lost to a Marine Ich (Cryptocaryon irritans) outbreak. Also, one of the other fish died due to a heater malfunction and subsequent electrocution. So, while some of the fish experimentally exposed to the Amyloodinium did exhibit MHLLE, there was no way to determine whether any of the control fish were still alive to verify the dinoflagellate, and not some other variable, as the cause of the MHLLE. As such, there is no way to draw any conclusions from this study. One report I found theorized that a bacterial infection might be responsible for a MHLLE outbreak (Hemdal, 1989). In this particular instance, a fish was in quarantine and because of a bad test kit, was exposed to a rather high level of copper, 0.4 ppm, greater than a ten-fold overdose. The error was discovered and water changes and activated carbon were employed to reduce the copper concentration. But the fish was still doing poorly, so it was transferred to a different system. Approximately two months after its exposure to copper, the fish developed a bacterial infection. The fish was treated with antibiotics and recovered, but relapsed shortly thereafter, necessitating a second course of antibiotics. Again, the fish recovered, but soon developed the classic appearance of MHLLE. The characteristic lesions developed rather quickly. It was said that in two weeks the fish showed erosion comparable to other fish that had been suffering with this ailment for six months or more. But, in an unexpected turn of events, as quickly as the condition appeared, it also vanished without any subsequent treatments, or dietary or environmental changes. Since the release of this report, its author has made a few additional commentaries. For one, he regrets not obtaining a histopathology report to back up his assertion that bacteria were responsible for the MHLLE lesions. Also, he wonders if the activated carbon, used to remove the overdose of copper medications from the quarantine tank, played some role in this outbreak. His current area of interest involves studying the irritant action of activated carbon dust and its possible effects in triggering MHLLE (Hemdal, pers. comm.). But I am not sure that I am willing to dismiss Jay's original inference. 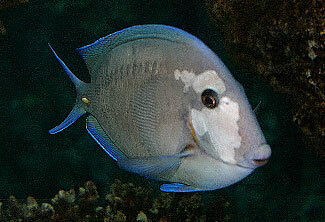 For one, Fish Tuberculosis (Mycobacterium marinum, http://reefkeeping.com...2003-07/.../index.htm) has been known to cause similar external lesions (Blasiola, 1990). Additionally, Noga briefly mentions in his book "Fish Disease: Diagnosis and Treatment" that he has documented cases of an acid-fast bacterial infection associated with MHLLE. He suggests that this may be evidence that the disease is a symptom of chronic stress in the afflicted fish, which leads me right into the next possible cause. This is probably one of this most interesting and novel ideas offered with regard to the causes of MHLLE. The basic premise is that fish held under certain conditions can be subjected to chronic stress and that due to this chronic stress, their immune system does not function properly (Bartelme, 2003a, b, c). This malfunction causes the body's own immune system to seek out and destroy healthy cells that it should otherwise be protecting. The author suggests a variety of ways this might occur, and I encourage all to read his works for further information. It simply would not be fair to try to sum up in a paragraph or two Mr. Bartelme's thoughts on this topic from his entire three part series of articles, so please follow up with my references (Bartelme, 2003a, b, c) below to read the complete and thorough explanation he offers. What I found most interesting about this theory is that it ties together most all of the other theories of MHLLE's causes (Note: there are at least a dozen other theorized causes. Just about anything and everything has been blamed at one time for causing this affliction. ), groups them under the general category of stress, or as an opportunistic infection that thrives under stressful conditions, and then addresses what to do about this "disease complex." The practical application of these articles is in the recommendations Terry gives for combating this ailment. The first part of the treatment would be to eliminate or reduce any and all stress. This is broken down into four broad categories: extreme changes in the physical environment, animal interactions (such as predation, aggression and competition), poor water quality (low pH, high nitrate, heavy metals or dissolved organics) and human interference (such as overcrowding). The second step is to improve the diet as well as to add vitamin supplements and highly unsaturated fatty acids (HUFA's) to the fishes' food. Third, improve water quality via water changes and protein skimming while also limiting the use of activated carbon just in case it plays a role. And finally, he recommends enhancing the fishes' immune function by adding beta glucan and garlic extract to their food as immunostimulants. Some people promote this fishkeeping methodology as an alleged cure of MHLLE (Hildreth and Hildreth & Paletta webpages). As such, it is worth reviewing the theory behind this allegation and comparing its reasoning against the theorized causes of MHLLE to see if there is any correlation. Unfortunately, the online articles don't have much to say about why or exactly how the system works. They merely state that fish held in EcoSystem filtered aquariums don't contract MHLLE, and fish afflicted with the syndrome get better when placed in an EcoSystem filtered tank. While their testimonials are interesting, it is hard to draw much information from them other than that we should all run out and buy EcoSystem's Miracle Mud! Joe Yaiullo of the Atlantis Aquarium was kind enough to share some information he received on treating MHLLE. Some individuals at the National Aquarium in Baltimore did small-scale testing of a drug commonly used to treat non-healing foot ulcers in human diabetes patients. The drug goes by the trade name Regranex or by its active ingredient, becaplermin. 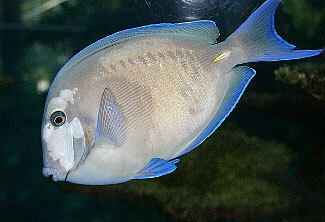 The aquarium staff was having a problem with an Atlantic Ocean surgeonfish (Acanthurus bahianus) that developed MHLLE. They did the standard things: scraping to determine if some pathogen was the cause, changing from their own homemade salt mix to a high-quality commercial blend, providing better full-spectrum lighting on a 12-hour photoperiod and reviewing and improving the diet, all to no avail. After all these changes, the most they had accomplished was to simply stop the disease's progression, with only a very slight improvement in appearance. It was at this point that they began the drug treatment. The Regranex was applied topically twice per week for four months. By fourteen weeks, the treated area was almost completely healed. The most interesting part of this little experiment was the control. They applied the drug to only one side of the fish and that was the only side that healed. The downside to this treatment is two-fold. For one, it does not address this ailment's underlying cause(s); it treats only the signs. Second, it is expensive and unavailable to most. At approximately $500 per tube, it would be cost prohibitive to most aquarists. The only people likely to afford this treatment are those aquarists able to justify spending $100 per polyp on Acanthastrea, Dendrophyllia or whatever is the new flavor of the month. captivity. Yes, captivity causes MHLLE. I say that jokingly, but there is also some truth in this statement. As I said previously, MHLLE has not been seen on wild fish on the reefs (Blasiola, 1990). We therefore deduce that it is obviously something we, collectively as hobbyists, are doing or not providing for our aquatic pets that causes this ailment. What exactly that is will require further scientific experimentation to definitively prove. Until then, I agree with the broad recommendations of Terry Bartelme: reduce stress, improve nutritional regime, add vitamins and HUFA supplements to the diet, enhance water quality and also try beta glucan and garlic. Those same things have almost always worked for me when I have had an occurrence of MHLLE in the fish I care for, and hopefully they will work for you. Bartelme, Terry. 2003a. "Hypothesis of Head and Lateral Line Erosion in Fish: HLLE, Stress and Immune Function, Part One" Freshwater and Marine Aquarium Magazine, September 2003, pages 100-104. Bartelme, Terry. 2003b. "Hypothesis of Head and Lateral Line Erosion in Fish: What Really Causes HLLE?, Part Two" Freshwater and Marine Aquarium Magazine, September 2003, pages 88-92. Bartelme, Terry. 2003c. "Hypothesis of Head and Lateral Line Erosion in Fish: The Role of Nutrition in Enhancing Immune Function, Part Three" Freshwater and Marine Aquarium Magazine, September 2003, pages 84-85. Bassleer, Gerald. 1996. Diseases in Marine Aquarium Fish. Bassleer Biofish, Westmeerbeek Belgium, pages 47-49. Blasiola, George. 1990. "A Review of Hole in the Head Disease of Fish" Freshwater and Marine Aquarium Magazine, May 1990, pages 34, 36, 38, 42, & 168. Borneman, Eric. 2003. "Mything the Point: Part Two" Reefkeeping Online Magazine, December 2003. Collins, Steve. 1995. "Dietary Control of HLLE in Blue Tangs" SeaScope, Volume 12, Summer 1995, page 3. Fenner, Robert. 1998. The Conscientious Marine Aquarist. Microcosm Ltd., Shelburne, VT, pages 160-161 & 308. Frakes, Tom. 1988. "Report on Head and Lateral Line Erosion" SeaScope, Volume 5, Summer 1988, pages 1 & 3. Frakes, Tom. 1993. "Nitrate Menace?" SeaScope Volume 10, Winter 1993, pages 1-2. Fry, Michelle Ann. 2003. "Investigating the link between the dinoflagellate Amyloodinium sp.? and marine head and lateral line erosion (MHLLE) on Zebrasoma scopas (brown sailfin tangs)" Norse Scientist, Volume 1, Issue 1, April 2003. Hemdal, Jay. 1989. "A Reported Case of Head and Lateral Line Erosion (HLLE), Potentially Caused by a Bacterial Infection in a Marine Angelfish, Pomacanthus semicirculatus" Drum & Croaker 22(3):2-3 1989. Hemdal, Jay. 2003. "Head & Lateral Line Erosion: What we know about HLLE in aquarium fish" Aquarium Fish Magazine, April, 2003. Hildreth, Robert. "Observations of EcoSystem and HLLE"
Hildreth, Robert & Mike Paletta. "HLLE and EcoSystem"
Holmes-Farley, Randy. 2003. "Iodine in Marine Aquaria: Part I" Advanced Aquarist Online Magazine, March 2003. Hoover, D. M., F. J. Hoerr, W. V. Carlton, E. J. Hinsman, and H. W. Ferguson. 1981. "Enteric cryptosporidioisis in a naso tang, Naso lituratus Bloch and Schneider" Journal of Fish Diseases, 1981, 4: 425-428. Hovanec, Dr. Timothy. 1998. "Revisiting Activated Carbon" Aquarium Fish Magazine, June 1998. Kessner, David. 1999. "Stray Voltage" Tropical Fish Hobbyist, April 1999, pages 142-148. Kessner, David. "Stray Voltages: Explained!" Michael, Scott. 2003. Saltwater Q&A: Hole-in-the-head disease is also head and lateral line erosion" Aquarium Fish Magazine, September 2003, pages 62-63. Noga, Ed. 2000. Fish Disease: Diagnosis and Treatment. Iowa State University Press. Ames, Iowa. Pages 245-246 & 282. Shimek, Dr. Ron. pers. comm. Varner, Patricia W. & Donald H. Lewis. 1991. "Characterization of a Virus Associated with Head and Lateral Line Erosion Syndrome in Marine Angelfish" Journal of Aquatic Animal Health 3:198-205. Pro, Steven. 2003. "Mycobacterium marinum: The Fish Disease You Could Catch" Reefkeeping Online Magazine, July 2003.